Linear ServoStep System is a closed loop operated linear actuator. System consists of IntelLiDrives linear stepper motor, IntelLiCoder feedback device and I-Drive smart amplifier. IntelLiCoder references the platen surface providing the feedback for the motor closed loop controls. I-Drive closes position and velocity loops in real time, providing brushless servo motor operation. 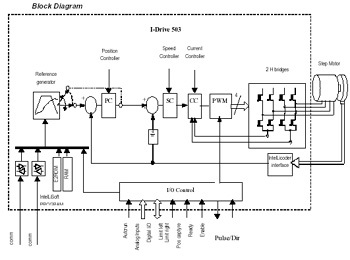 I-Drives interfaces with step motor indexers through pulse/direction interface.